My Mom grew up in Germany, and for her trade she became a seamstress. Her sewing basket has been in my closet for years, and I have gone to it for a variety of items, but really hadn’t paid it attention. She has a ton of items in it, but that is for another day. 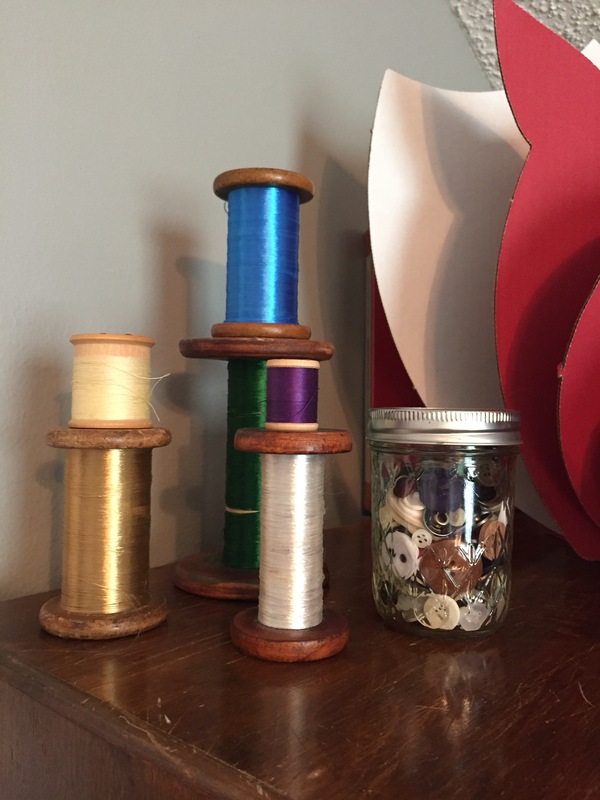 So when I was going through my basket to sort, and organize (mainly buttons, and safety pins), I discovered these (cream and purple) wooden spools. They still have the original stickers on the top of them. I also combined all of the buttons from a basket in the closet, to the ones in both my sewing basket and my Mom’s. I wanted to put them in a see through container but something cute. I found this jelly jar in my kitchen cabinet, and I love the way it looks both on the cabinet with the wooden spools. I love finding pieces of memories of my family that I can incorporate into my space. I love seeing these items and thinking of sweet times with my mom. It’s the little things. Craft Room · Finds · Random Thoughts · thoughts · Uncategorized · WPS! 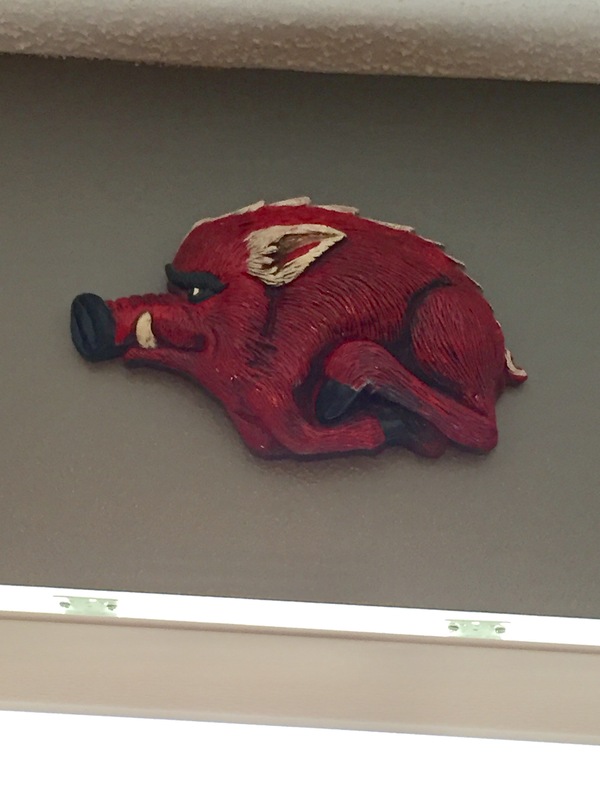 Woo Pig Sooiee! or WPS! Growing up in Northwest Arkansas you have to love the Razorbacks. All things Razorbacks. 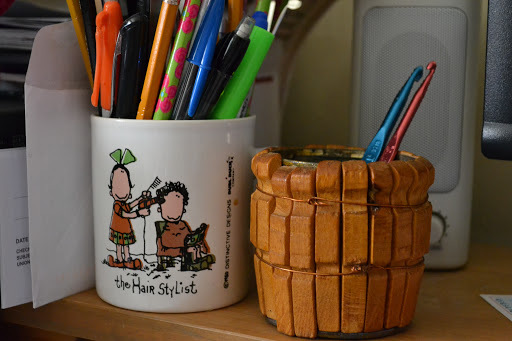 My love for them is apparent in my craft room from things that I have purchased over the years. My favorite addition, however, is one that I found again from the garage. My Dad painted this for his bar, and it hung there for many years. I had it in the garage, just because I really didn’t have a place for it in the house. But now I do. It hangs over the window. A prime spot I believe. I will see it upon entering the room, and whenever I look out the window. It really doesn’t look like much. And to anyone else looking at these items, I am sure that they would dispose of them just as quickly as I did the other items on the shelf. 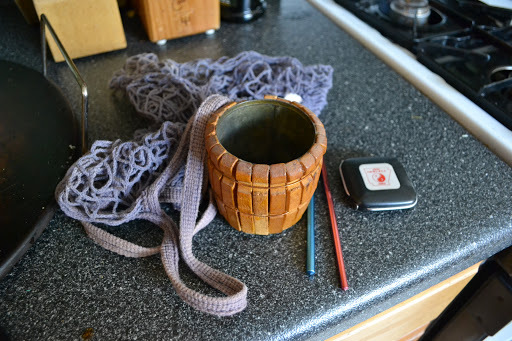 But, if you look closely, you will find a measuring tape, two crocheting needles, a crocheted bag, and a cup made of tin and old clothespins. What you don’t know is that these are my Mom’s crocheting needles that I have looked everywhere for after she passed. So 6 years now, lost and now found. Joy. Leaping joy! The bag is from Germany, and is used for shopping at the bakery or butcher shop. You have to carry your own bag (Germany has a handle on the re-use bags—we in the US should take note), or purchase one and they can be expensive. My mom used this one all the time. Measuring tape was from my Dad. He would keep this in his pocket just to measure whatever, because you never know when you come across something you need to know how long it is. ha. The cup. That cup was a Father’s Day gift to my Dad that I made when I was in the Brownies. Yes, Brownies. So I had to be 5 to 7 years of age. Crazy. It is made from a soup can with a top cut away, clothes pins that have been taken apart, glued, and secured with copper wire. It used to set by the land line telephone (remember before cell phones?) in the kitchen with lots of pencils that were sharpened by a pocket knife. Now it sets by my moms coffee cup, right where I can see it daily. Treasures found. Really. I had no idea that my mother kept this after all those years. As I am going through rooms, buckets and bins, I am discovering more of these things. Many things I am disposing. But these items today, brought back a smile, giggle, and tears.